August 13, 2012 . I was able to spend august 11th and 12th at the Roque de los Muchachos observatory, visiting Patricia during her observing run. These dates were not randomly picked: they happen to be the nights when the Perseid meteor shower reaches its maximum. For more info see Wikipedia. During the night of 11-12 august the meteorological circumstances were not good to observe shooting stars: the sky was very hazy due to a dust cloud reaching us from Africa. The night of 12-13 aug was much better and we could see more than 25 Perseid meteors, plus some sporadic meteors (i e not part of the Perseid cloud, thus moving in another direction in the sky). 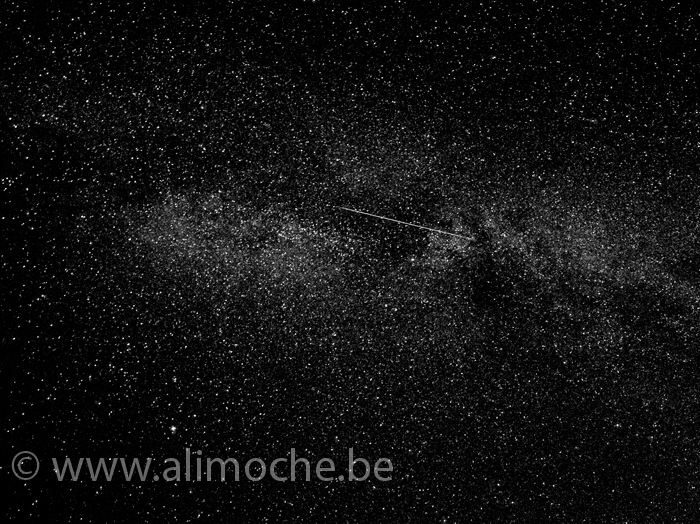 Our image shows a Perseid meteor moving through the constellation of Cygnus and the summer milky way. Leaves us with one important question: is it true one can make a wish when seeing a shooting star? Sure, why not ! One Response to Make a wish …. Should I make the wish on viewing this photograph of a shooting star as I forgot all about it yesterday ;-)?